Geneva 2012: Mitsubishi Outlander | What Car? Mitsubishi has put the new Outlander centre stage on its Geneva motor show stand. 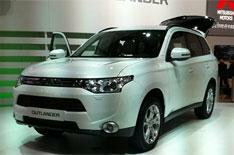 The new SUV will carry a revised version of the 2.2 diesel from the current outlander. However, Mitsubishi hopes that making changes will bring CO2 emissions down to less than 130g/km. The most notable change is the new front look with softer lines replacing the fighter jet nose of the old car. Inside it gets a new sat-nav, which is the same as the one in the Shogun. It also gets adaptive cruise control, lane assist and dual-zone air-con. New soft-touch plastics lend a much more high quality feel to the interior. The four-wheel drive system is now controlled by a button rather than through a dial. An Eco mode brings uses two-wheel drive only while a locked 4x4 mode divides power equally between the two axles. Both an automatic and a manual gearbox will be available, both with six speeds. There will be no dual-clutch SST option though. A plug-in hybrid model will go on sale in the future with CO2 emissions hoped to be around 50g/km.